Jamaican based music rapper Mr. Vegas is already in the country for the Club beer sponsored Easter Street Jam organized by Club Silk scheduled to take place today Vegas, being the guest performer jetted in the country on Friday morning(3:00am)aboard the Turkish Airlines. On his arrival, he came along with four members who included a babe only identified as Hyper making the number to five. "Last time when I came to Uganda, I didn't rock well my fans but this time round it's gonna be hot. I also like to see Uganda ladies storming the show and singing with me as I perform" Vegas told reporters at Entebbe. 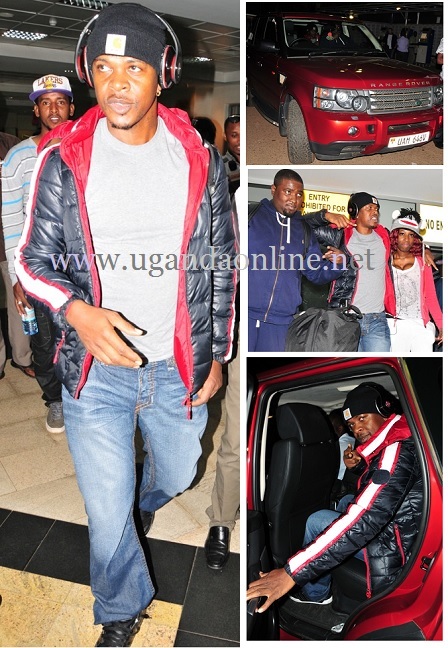 He was welcomed by Club Silk's music manager Bob and Talent Africa's Aly Alibai among others. Meanwhile, Mr. Vegas was being interviewed on the Sanyu FM's drive show yesterday with Crystal and Lionel as the hosts but interestingly, five minutes into the show, Lionel was already using the Jamaican accent making Crystal laugh uncontrollably. Mr. Vegas refused to divulge into details of his affair but said that he wanted the Ugandan gals to storm the venue in large numbers.